A list of Keswick Hiking routes with Photo Tours and Maps. The hike routes are from 1,200ft up to 3,200ft. Of the four mountains in England over 3,000ft, Scafell Pike, Skafell, Helvellyn, and Skiddaw, three are easily accessed from Keswick, Scafell is the only one difficult to reach from Keswick. Many hikers at Keswick use the buses as they often allow more variation to the hikes. The Keswick Bus Station is in the centre of town next to the large Booths Store. Google Keswick Bus Stops, Bus Numbers and Routes . Handy numbers to have are for Keswick Cabs Office: 01768 736 996 or Mobile: 07428 091 915. This company provides pick up and drop off services for hikers and dogs. 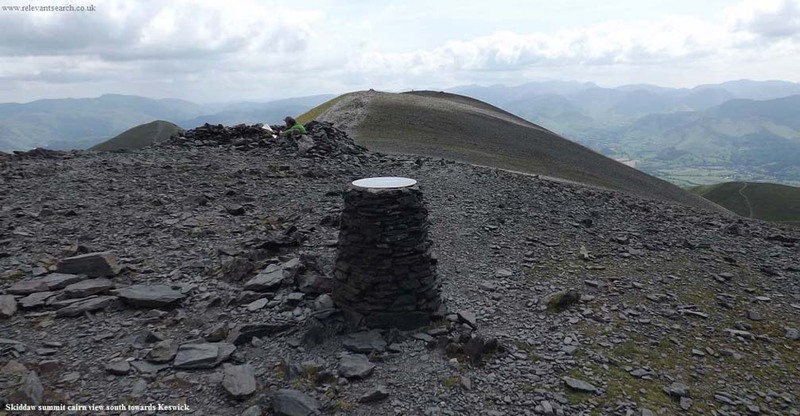 The Keswick Hiking routes are listed by closest to Keswick. Skiddaw Mountain is situated right next to Keswick, on its east side. There is a hiking trail from Brundholme Road in Keswick, over a road foot bridge, and up onto the mountain. There is also a car park up on the mountain side at about 950ft above sea level, that allows an easier hike to the top. There are also two tougher routes up from the west and north. Catbells mountain is situated across the lake from Keswick. Many hikers take the boat from Keswick across the lake to a landing close to Catbells, many use the hiking buses from Keswick, and some drive round, but there are few parking spaces. This is an exceptionally popular hike with some of the best views in England. There are three more mountains on the same range up to 2,470ft. The 1,994ft High Seat and 1,935ft Castlerigg Fell are situated about 3 miles south of Keswick, with a good path round the two. There is a large car park for the hikes next to the scenic Ashness Bridge. Buses dop off at the start of the hill road to Ashness Bridge, about half of a mile walk up to the bridge from there. There is also a trail along the side of Castlerigg Fell to Keswick. 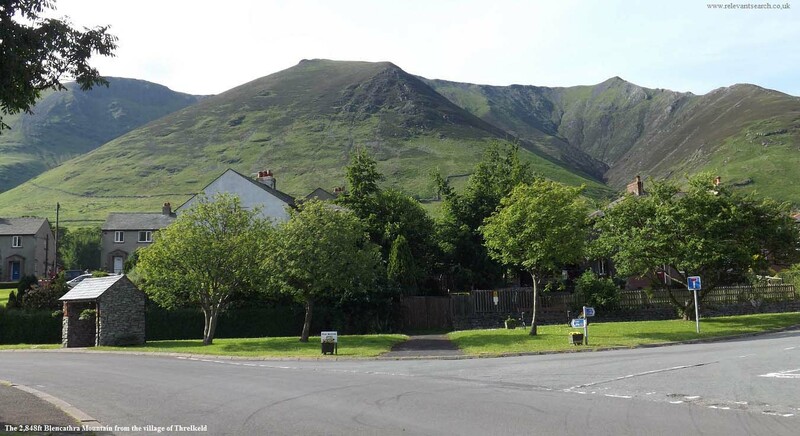 Blencathra mountain is situated about 4 miles east of Keswick at the village of Threlkeld. There are regular buses between Keswick and Threlkeld. Blencathra has about 6 routes to the top, some fairly safe and straight forward, and others with testing ridges, such as Sharp Edge, and Halls Ridge. The car park at Thirlmere is situated about 7 miles south of Keswick with a bus stop and regular buses that run between Keswick and Ambleside. This is a fairly steep route up to the top of Helvellyn Lower Man, then a short hike on to Helvellyn itself. On the far side of Helvellyn is Swirled Edge and Striding Edge, for the adventurous. The car park for this hike is at Seathwaite Farm by Borrowdale, about 9 miles south of Keswick. There are regular buses from Keswick that drop off and pick up at the Seathwaite Farm entrance. It is about 1 mile from the entrance to Seathwaite Farm for the start of the hike. This is the scenic route to Scafell Pike, and very popular, up past waterfalls, a large tarn, and between some of the other highest mountains in England. Mid way on this hike, the View Down into Wasdale Head is amazing, considering it takes hours to drive round to it, yet you can walk there in under an hour. This hike starts from the scenic village of Grasmere, about 12 miles south of Keswick. There is a large free car park a few hundred yards north of Grasmere where most hikes to Fairfield begin. Regular buses also run between Keswick and Grasmere. There are about ten hotels in Grasmere with beer gardens, so no shortage of places for a drink and meal after the hike. This hike starts from the scenic village of Grasmere, about 12 miles south of Keswick. There are two large car parks, as the village is so popular. Regular buses run between Keswick and Grasmere. The hike to the top gives great views over the village and Grasmere Lake, one of the most scenic places in England. There are about ten hotels in Grasmere with beer gardens, so no shortage of places for a drink and meal after the hike. These are the main hiking mountains around Keswick. There are many more, but once you have hiked these, you will have seen the other lesser known mountains, and know the ones you want to hike next.